Set plays are a key scoring opportunity outside of field goals scored in normal play; learn how to control game scenarios and shut down the opposition’s scoring chances. Whilst I have written about a raised glove positioning at corners, to allow you to make high saves from a standing position and also to make bringing the gloves into position during a high dive easier, there is also a good reason to have your gloves down low at a corner. 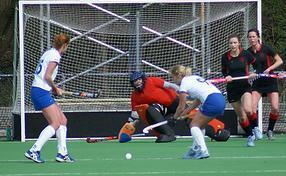 It all depends on the level you play at and the style of drag flicks or shots you face. 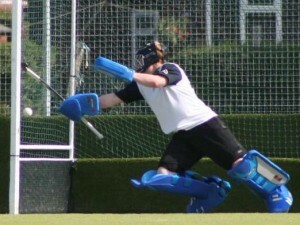 Standing up with gloves high, it is easier to move in to save a high flick, but if you are facing a difficultly placed flick that you cannot reach with your legs down low, where you may have to dive low and with low gloves, is obviously easier to get closer to the ball more quickly from that position. Having low positioned hands equates to being able to bring your gloves into play to stop a low ball, where you are extending out wide against a difficult-to-stop drag flick that is not quite on the floor and not particularly off it. 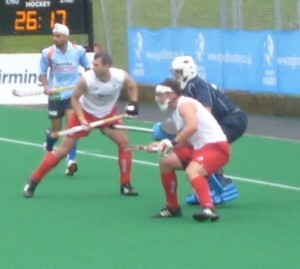 Whilst a lot flick takers do go to flick high, there is a lot of sense in having a low glove positioning in your stance to allow you to get nearer a low ball with your gloves when facing a low placed and very difficult to stop, tricky, drag flick wide, low and down, or into the corners, where you need to really extend and push out into making the save. Just like where you have your gloves high to move up or out, from a standing position. With your gloves low you can quickly bring them in to block the ball as you make the dive; already low, allowing you to drop them even quicker to stop the ball. 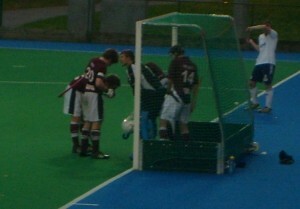 It’s something Nick Brothers did a lot when playing club hockey for national premier league side Reading and when representing England or GB internationally (he has hung up the pads, sadly). 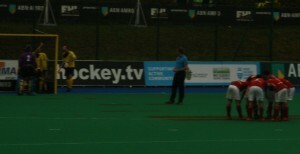 Nick Brothers had his gloves low in a general stance (which you don’t seem much of these days) to help getting low for a save more quickly (seen at 9:01 http://www.youtube.com/watch?v=s2SeiavimsE) and Simon Mason seems to still uses a stance like this (well, his gloves are low at least!). 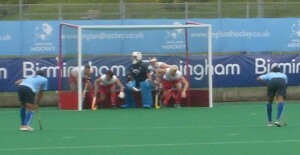 But, he also kept this low glove stance when dealing with short corners. Unlike Brother’s stance where his gloves were outside the body than tucked beside, there seems to be a new trend in goalkeeping, which I wanted to comment on after the realisation! This alteration can be noticed if you watch Stubbings and Belgian goalkeeper van Rysselberghe (who’ll be mentioned later!). 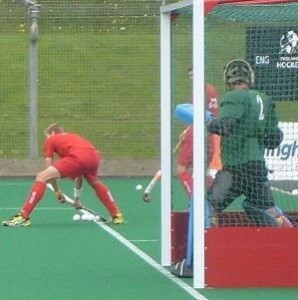 Diccon Stubbings (goalkeeper for Canterbury in the England Hockey League) has made an interesting change to the way he sets up at penalty corners, with a ready stance, that almost looks lackadaisical (edit: yes, I get to use an awesomely elongated word when discussing goalkeeping!) 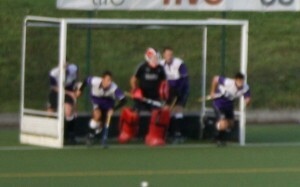 and kind of displaying an nonchalant within the ‘mental game’ regards to outside , unaware of goalkeeping technique and perspective! His gloves are just still by his side then pushed out into anything resembling a ready stance. Here is the new stance I’ve seen of him using at Canterbury, essentially just a very relaxed stance, with the gloves dropped to his side, ready to push out low. In the following video, noticing how he gets low quickly to stop (he’s in the red TK pads and black shirt and black helmet) and generally reverts to a low glove positioning in his ready stance when shots are in close. At about 9:24 you can see this in practise. 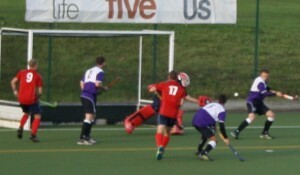 Richard Mantell likes to flick low and Stubbings has obviously gone with expecting him to and it looks like the ball goes wide, or he does manage to make a cracking save getting low with the stick. 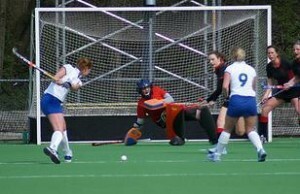 On the consecutive corner, you can see how having a low glove stance makes it easier to block standing up against a flick near to the hips and around the body, or to dive into, if necessary. 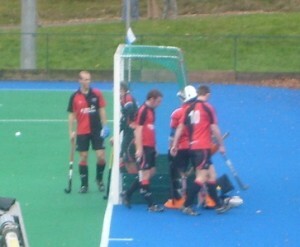 The photo below illustrates the stance where he would set up with his gloves low. This is also something Belgian international goalkeeper (Vanasch has beaten him out of the starting spot, with Gucasoff now second choice and Leroy having been part of the training squad), David van Rysselberghe, does a lot of. 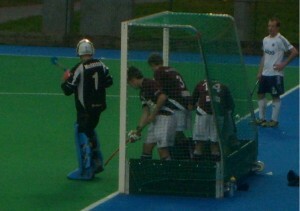 Rather than keeping his gloves up at shoulder or chest height in his stance on the corner (the rest of the time for game, he retains a ‘normal’ ready stance with gloves up around chest/shoulders, a lot like Stubbings), he keeps his gloves very low, in case of the danger of a save that is down towards the backboard. Ignore the goal but notice how low he keeps his gloves, and like Stubbings, basically stands there looking like he’s not really bothered, gloves dropped to the sides of his body! It all depends on the flicks you expect to face. 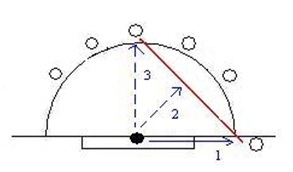 Most of the time, I would expect flicks to be higher; around head height, wide of you, or wide of you outside the body (hip height say, where you have to extend out into a dive to reach). 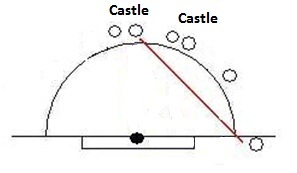 But some flick takers like the difficult positioning just above the floor and at the post or between you and the defender, which is tricky to defend and can cause confusion. Assumptions can be made depending on the places the flick takers look to go for. 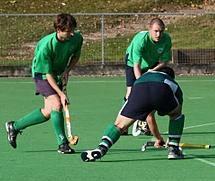 Scouting your opposition always helps and is essential for this approach. It’s still possible to get your gloves low from a raised position in your stance when you dive, but it depends on where you expect the ball to end up and if you need to extend as far out as possible to reach the corners etc. It’s something I’m going to write about in more detail in another article.